Need Help with your Knox™ Box? For New Construction, remodels, tenant finishes, or any other project requiring plan review and permits, contact the Construction Services Office at 719-385-5982. For Existing Buildings where no construction is involved, contact the Division of the Fire Marshal at 719-385-5978. Any building equipped with a monitored fire protection (suppression and/or detection) system. When access to or within a structure or area is unduly difficult because of secured openings. Key lock boxes and similar products manufactured by the Knox™ Company are the only type approved by CSFD. All Knox™ products shall be ordered directly through the Division of the Fire Marshal. NOTE: Knox™ residential-type boxes are not allowed on commercial properties. Any that will provide Fire Department emergency responders access to all areas of the building. Rooms with fire protection equipment. Those required to operate the fire protection equipment. In structures equipped with elevators, one for each elevator car. When electronic locks are employed in any portion of a building, two copies of the appropriate codes and/or electronic key-cards. The key box shall be installed at a location approved by CSFD (normally adjacent to the main entrance). The box shall be clearly visible and mounted in accordance with the manufacturer’s recommendations with the exception of the installation height. To 3 discourage vandalism, all models shall be installed between eight (8) and twelve (12) feet above grade. The Division of the Fire Marshal requires a window decal on each exterior access door to alert firefighters that a key box is provided. One is included when the Knox™ Box is shipped, therefore, additional decals, based on the total number of exterior doors, shall be included on the order. A Knox™ Key Switch is required on all electronic gates within the city limits which restrict access to a site and/or restrict access to a fire apparatus access road. It is the only Knox equipment allowed on electronic gates. They operate similar to any other type of electronic switch. An advantage to this device is that it allows CSFD to keep the gate in the open position for other responding emergency vehicles accessing the site and thus reducing response times. In many situations, it is critical to restrict access across a driveway or roadway; however, these areas must also remain accessible to the Fire Department in case of an emergency. A Knox Padlock is required where a chain or manual gate is being utilized in this manner. Shackle size – please verify the shackle size and that the links on the chain are large enough to allow the padlock shackle to pass through. 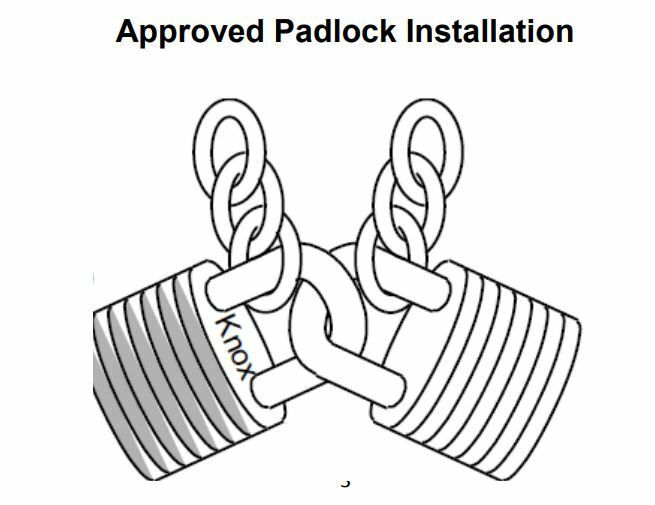 Utilizing two padlocks – A standard lock and one manufactured by the Knox™ Company can be hooked together as indicated on the diagram below. This will allow access to both the owner and the Fire Department personnel. Orders for Knox™ products shall be reviewed for approval by the Division of the Fire Marshal. Orders may be placed directly through the Division of the Fire Marshal by using the Knox™ order form, or through the Knox™ Company’s website. All equipment is delivered to the Contractor’s listed address. Lockup of Knox™ equipment is coordinated and completed by Fire Department personnel. Contact the Division of the Fire Marshal or Construction Services to coordinate.